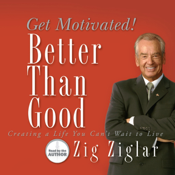 Expand your enjoyment of literature with BETTER THAN GOOD: GET MOTIVATED! by Zig Ziglar (unabridged). This interactive mash-up experience contains a multitude of features and content to help take you beyond the words, by providing a 5-star professional reading, background extras, and more. NOTE: This app is fully accessible, and includes support for VoiceOver. Create the life you were meant to live! He is “the” premier motivational communicator, having inspired millions worldwide with his stirring seminars and top-selling books like See You at the Top! 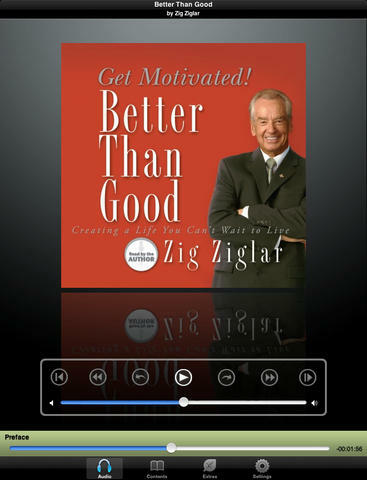 But this time, Zig Ziglar offers up an audio book that cuts deeper and burns brighter than any success book before it—one that transcends even his own previous work and challenges you to new levels of excellence and achievement. On the topic of living a life of motivation, passion and peak performance, nobody knows it better than Zig, and nobody tells it better than Zig. Self-contained, this app is perfect for your commute, on a trip, or while relaxing. This app was built especially for your iPhone, iPad, or iPod Touch, meaning it fits your device perfectly. The audio is of higher-than-normal quality, making for a great listening experience that will not tire your ears or grate on your nerves. This was professionally recorded at the Oasis Audio studios by the author. • EXPERIENCE. About 7.75 hours of narration. Created on the Folium enhancedAudio™ framework, this app includes extra functions and features not found in either e-book readers or audiobook players. • PLAY IT YOUR WAY. Listening at home or the office? Tap into remote speakers with AirPlay. • CONTROL IT. The audio player offers multi-speed fast forward/reverse, jump ahead/back, chapter skip, volume control, plus a one-touch chapter browser. The ‘scrub’ bar lets you point anywhere inside a chapter with just a tap, and now you can shake‘n’pause to temporarily halt playback instantly without looking at the screen. • SLEEP TIMER. Have you ever fallen asleep watching TV or listening to a book? If so, you'll love this feature. Once set, the playback will stop, place a bookmark, and allow you to jump back to where you probably began dozing. • OFFLINE LISTENING. You are airline-approved! Once you’ve downloaded the app, you’re free from the threat of an interrupted connection. Downloads usually take just 5-10 minutes, but depend upon your network speed. • CLEAR & ELEGANT DESIGN. Simple, clean, intuitive, and intelligent. • CHAPTER TIMINGS. Always know how much time it will take to finish a chapter. Plus, the progress bar at the top of the screen shows how far into the recording you’ve come. • AUTO-BOOKMARKING. The player remembers where you stopped listening and returns to that exact spot when you open the app again. • TELL-A-FRIEND. An easy way to recommend the book to your friends. • FEEDBACK. Share your ideas for functions, and features. We are very responsive to our listeners and appreciate all feedback and ideas. • GET MORE. Other titles that you might enjoy are updated over time, helping you find that next great experience to enjoy. RATING: Suitable for anyone who wants to achieve their long-term goals of excellence and success.